ten fingers, ten toes WHAT EVERY MOTHER MUST KNOW TO PROTECT HER UNBORN BABY was written to address a critical information gap. 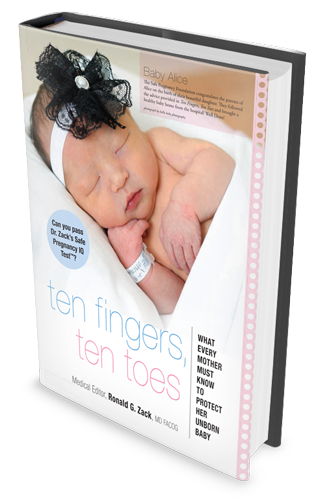 ten fingers, ten toes was written to make sure that every mother has the information she needs to have a “No Regrets” pregnancy. When you know the risks that occur throughout your pregnancy, you can intelligently manage them. As you begin this incredible journey through maternity, you will never regret the time you invest in learning about your pregnancy and the intelligent, responsible choices you can make to protect your unborn baby. Remember, your baby’s counting on you. Your “No Regrets” pregnancy begins with the information contained within this book. DON’T FORGET: Every book we sell comes with our 30 Day Money Back Guarantee! You’ll have an entire month to get started reading our book with zero risk! Dr. Ronald Zack, M.D., a director of the Safe Pregnancy Foundation and medical editor of ten fingers, ten toes, is a longtime advocate of Pregnancy Education. What’s Pregnancy Education? A body of knowledge that every expectant mother must know to protect her unborn baby.